Here's our itinerary for a week on the Isle of Wight on a budget, with free and cheap days out. Many families end up enduring a week in a one star hotel on the Costa del Grot because they think England is too expensive - but there is loads to do for free on the Isle of Wight. We've also got an itinerary for a rainy weekend, and a guide to free days out. The Isle of Wight ferry can be expensive, but it can be as cheap as £10-20 per person if you are flexible and travel with a car full. 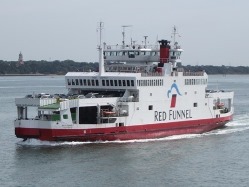 See our guide to discount Isle of Wight ferry travel for some ideas, such as booking your ferry via an accommodation provider or using Tesco Clubcard points. Our guide to 'where is the cheapest place to stay' concluded that, unsurprisingly, camping and caravan sites are usually your cheapest option. There are more in our holiday park guide. Brambles Chine and Linstone Chine self catering which can work out at as little as £7 per person per night. A car is useful on the Isle of Wight, but not essential. If you are travelling on foot, have a read of our guide to Isle of Wight public transport. At the time of writing (2018) you can get unlimited bus travel for 5 people for a week for £55, which is £1.57 per person, per day. It's a bit slower than travelling by car, as most buses go via the county capital of Newport but it is a good low cost option and will save you parking charges. Getting to the seaside is essential on your first day, so head over to the South East Wight which is the most touristy part of the Island. You can either park in Shanklin and walk along the esplanade to Sandown (it's a couple of miles so not even worth attempting with teenagers) or just park at Yaverland (PO36 8QS). Sandham Grounds by Yaverland car park has a fantastic playground, with something for all ages including an outdoor gym for adults and a basketball court (all free). Yaverland beach is quieter than Sandown and Shanklin which have more facilities, such as amusements on the pier. All three beaches are family friendly with clean water for swimming, toilets and parking (not free in the summer unless you're willing to walk a fair distance). If you want to splash out then you can hire pedalos and kayaks in Shanklin from as little as £5. Personally I prefer Shanklin to Sandown due to the former's attractive imposing cliffs but they are similarly busy with an English seaside feel. If the playground and seaside don't provide enough entertainment then Dinosaur Isle in Sandown is cheap (about £5). There are loads of places to buy 'chips with everything' meals, but there are also reasonable sized supermarkets in the area if you have a car and would rather bring a picnic. The Crab, Shanklin (PO37 6NS) does cheap pub grub. In nearby Lake, Morrisons has a cafe (PO36 9PA). The Isle of Wight is one of the few places in England with red squirrels, which are cute and shy compared to their aggressive grey cousins. Parkhurst Forest is a good place to look for them, as it has a specially designed 'hide' for visitors. The nearest postcode to the hide is PO30 5UL (see map below). If you've managed to balance bikes on the back of the car you can take them for a ride around the Forest. In the afternoon, I would recommend a trip to the famous sailing town of Cowes, which is about 15 minutes away in the car. It is crammed full of men with turned up collars during Cowes Week in early August (see our Cowes Week guide) but is still nice for a potter about during the rest of the year. We enjoy the walk along the esplanade to or from Gurnard, which can be managed with a pushchair. There's a cafe on Gurnard seafront for an ice cream - or if you're as frugal as me you will start at Gurnard where there is some free parking and end up in Cowes where you can buy a multipack of ice creams at a supermarket...Don't judge me. Cowes and Gurnard are less good for swimming as the beaches are quite small but some people do still take a dip at low tide (try not to swim into a cruise ship). Other free things to do in that part of the Isle of Wight include Cowes Maritime Museum, working monastery Quarr Abbey and St Mildred's Church in Whippingham which has links to Queen Victoria. There is also a floating bridge which links Cowes and East Cowes, which costs a few pennies (£1 at the time of writing, 2018). One option is to buy a TasteCard or Gourmet Society card. These require an investment but once you've got one you usually get 50% off or 2 for 1 as long as you don't eat on a Friday or Saturday. The Fountain, Cowes (PO31 7AW) does cheap pub grub. I'm in two minds as to whether I should recommend Alum Bay and the Needles for a cheap day out, as there are plenty of opportunities to spend money. However, it is possible to see one of the Isle of Wight's more popular attractions for next to nothing. In the afternoon, head over to the South West Wight along the stunning coastal road where you'll find Hanover Point (sometimes called Shippards Chine), Brook Chine or Compton Bay. Unlike Sandown, these are backed by natural eroding cliffs and have little in the way of facilities (take food with you). Hanover Point has toilets and an ice cream van most of the year but that's about it. Instead, they offer gorgeous views, waves for bodyboarding or surfing and tranquillity during the early evening. As the sun sets at low tide after a hot day you'll find it impossible not to take a thousand arty photos, and you'll wonder why you ever went to the Costa del Grot. If you wait until dark, you'll find that it's a terrific area for stargazing with minimal light pollution, apart from an occasional car on the Military Road which runs along the coast. Alternative free things to do in the West Wight include a wander around the tiny town of Yarmouth with its pier and ferries or watching the crashing waves at Freshwater Bay at high tide. There are also pretty beaches at Totland and Colwell - see our best Isle of Wight beaches guide for more details. The East Wight is the order of the day, firstly to visit the Lifeboat station in Bembridge where there are often free tours. Bembridge is a pretty town, which is also home to the country's oldest working phonebox (well, I think it is but I've not had a great deal of luck confirming that fascinating fact). In the afternoon, you have a choice of attractive beaches. Appley at Ryde (PO34 5AR) is popular because of its (paid) parking, facilities and massive sandy beach. There is also a nearby park at Puckpool and a playground on the esplanade. Personally I favour Priory Bay at Seaview (round the corner from Seagrove Bay) or St Helens (PO33 1XY). The former is harder to access and is often too shallow for a proper swim but it has gorgeous golden sands which are apparently imported. St Helens is a bit better for parking (there's a free car park for National Trust members) and it has a nice busy atmosphere on a sunny day. You can also spend some time crabbing in the rock pools at St Helens or around Bembridge at low tide. Other cheap options in that part of the Isle of Wight include the cinema in Ryde, which may be rather small and quaint, but is also very good value. At the time of writing it is £4 per person (2018). See our best Isle of Wight beaches guide for more detail. There used to be a Wimpy in Ryde, but that disappeared a little while ago. There are still a few fast food chains though, including McDonalds (PO33 1QG). Fans of carveries might consider the Stonehouse Carvery in Wootton (PO33 4HS) which is on the way to Ryde if you are travelling from Newport. There is a Wetherspoons in Ryde (PO33 2LF). The south of the Isle of Wight has lots to offer but it's a bit of a drive if you are staying around Ryde or Cowes so it is worth cramming a few bits in. Start at Bonchurch and make your way towards Shore Road (PO38 1RN). It's not a free car park, so you could park further away and walk. We then like to head down to the walk along the seawall which is wheelchair and pushchair friendly and leads into Ventnor (although it starts with a very steep downhill). Ventnor itself has a nice beach with clean water for swimming and a free paddling pool shaped like the Isle of Wight. There's a lovely esplanade with plenty of places to eat and public toilets. After you've made the most of the beach, you might like Ventnor Park (PO38 1LB) which is a pretty and free public space which has regular performances from the bandstand. Finally, if you've got time you could visit Old St Boniface Church (PO38 1RQ) which has sections dating back to the 11th century and is open most days for free visits. On your final day, I would head to the South Wight again to explore pretty Steephill Cove (see our guide to Best Beaches). It is a little trickier to access than some beaches but it has the feel of a Cornish fishing cove with a tightly packed beach overlooked by attractive cottages. There isn't a huge amount of beach but it is tranquil spot and fairly good for a swim. If you time it right you will see cricketers trying not to hit the ball in the sea at the nearby cricket ground. On the way back, stop off at either the Isle of Wight Donkey Sanctuary (PO38 3AA), Godshill village, Carisbrooke Priory (PO30 1YS) or Carisbrooke Castle (PO30 1XY). The Isle of Wight Donkey Sanctuary is free, although they do offer adoptions and rely on donations. Carisbrooke Priory is a former nunnery, still run by Christians and offering an open door on certain days for people wanting to explore the attractive gardens, cloisters and chapel (for free). Carisbrooke Castle is a paid for English Heritage attraction, but it is free to walk around the (dry) moat which offers nice views and still gives you a good idea of its scale. I would guess it is about 3/4 of a mile round the edge of the Castle (it's a bit too bumpy for pushchairs and standard wheelchairs, unless you have pneumatic tyres). Godshill is mostly featured on souvenir boxes of fudge, with its twee thatched cottages. Personally I find it a bit busy, but it is pretty so you might fancy a quick mooch. There are plenty of cheap places to eat if you know where to look. We've included some alongside the days activities to avoid lots of travelling but you will probably find that you are often driving via Newport, as it is the central town which links up most of the other smaller towns. Pizza Express (PO30 1XB) - standard prices are a bit high, but they often do offers. Hogshead (PO30 1SS) offer cheap pub grub. The-Isle-of-Wight-Guru-Don't-Blame-Us-Disclaimer™ The information on this website is correct, as far as we know, but please do check opening times and details with attractions and restaurants directly if you are planning a long journey - and please contact us if you find anything inaccurate.